Many equate Volvo with a rectilinear design aesthetic that affords the aerodynamics of a mid-century modern home. Today's Nice Price or Crack Pipe 122S may fly in the face of that paradigm, but does it also come with a price that's grounded in reality? With the introduction of their 1949 models, the Ford Motor Company took a quantum leap in styling, sloughing off the prominent fenders and ship's prow hood of the ‘48s, a look that was little changed from the pre-war cars. The new shoebox design not only looked like no Ford before, but its rabid acceptance in the market saved the company from financial ruin. 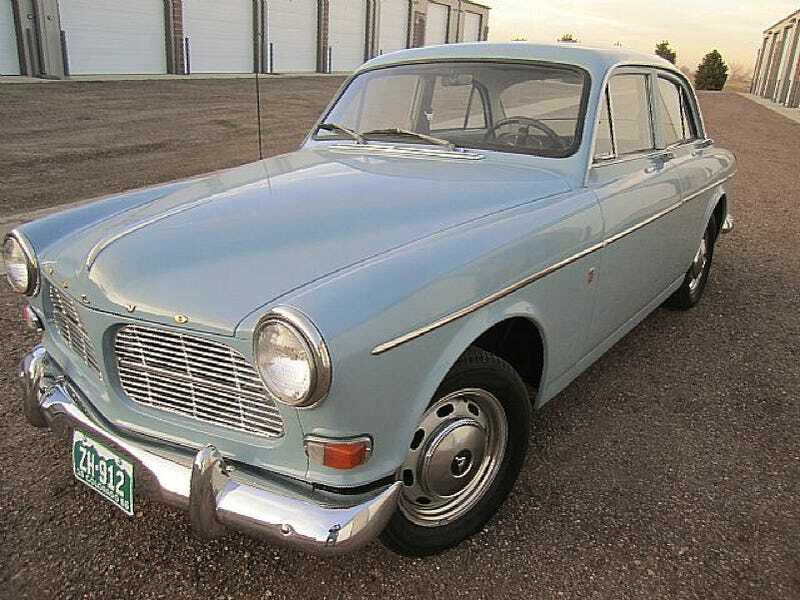 Seven years later, Volvo replaced their PV series - which looked uncannily like pre-war Fords - with a car that was also a major shift in design, although it's hard to say whether or not the fate of the Swedish company rested on the new Amazon's success. While significantly changed in appearance, the new Amazon - or 122S in the U.S. shared wheelbase, basic engine design, and unibody construction with its predecessor. Unlike that car's Single White Female Ford-ness, the new models seemed to take their styling theme from Chrysler's big cars - notably the New Yorker. The Volvos however were smaller, providing much more traditionally European proportions. Bodystyles did expand in number to include 2-door, 4-door sedan, and utilitarian wagon. Today's 1966 122S is the classically handsome sedan, painted a shade of blue you might imagine matches a Swedish winter sky. That paint looks to be in excellent shape, as it should be as this 122S is claimed to have enjoyed a full restoration. 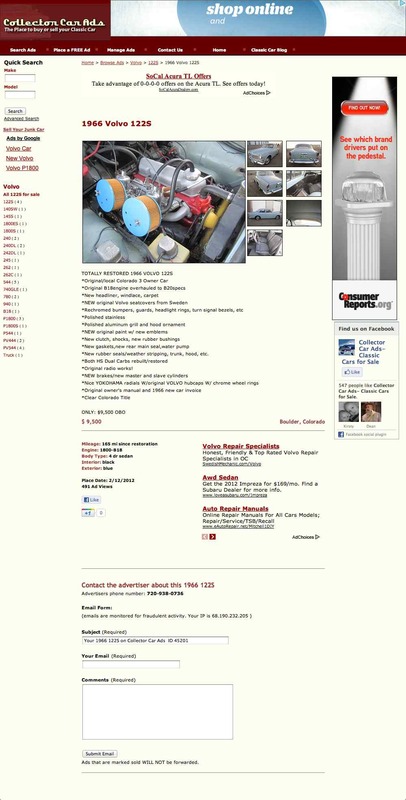 That doesn't just mean a visit to the Earl of Scheib and a dash mat, the ad noting that on this car everything down to the weatherstripping, headliner and carpet has been renewed, and it has also seen significant refreshing to all the major mechanical systems. Under this 122's hood is the expected B18 OHV four, however the seller says it has been brought up to B20 specification. He doesn't say which gearbox backs up that engine, but it is a manual (boohyah!) which could be the M40 four speed, or M41 with overdrive. The later would be most welcome if highway driving is in this classic's future. As noted, the whole interior is new, including Sweden-sourced seat skins and what's claimed to be a working original radio. Outside, all the brightwork has been polished, and new badging has replaced the old. Not in keeping with the Swed-centric restoration, the tires are Yokohama mamas. There are almost always a number of Amazons for sale at any given time, the car having been a steady seller over its amazingly long 14-year lifespan, but few are in as nice of shape as this one. Of course that condition warrants compensation, and the asking price for this 122S is $9,500, which puts it in the categories of both best condition and highest price of those Amazons available these days. What's your take on that price, does that make this an amazing Amazon? Or, does the seller need to cut a few Kronors? Collectorcarads or go here if the ad disappears.